March 2016 - A Life From Scratch. With both L and now B starting baseball in April we are all PLAY BALL(!!!) over here. It seems like we’ve been waiting forever for the season to start. L has been training since December and B, well, he’s been anxious to go since day one. (His night time lullaby is ‘take me out to the ball game.’ No joke.) 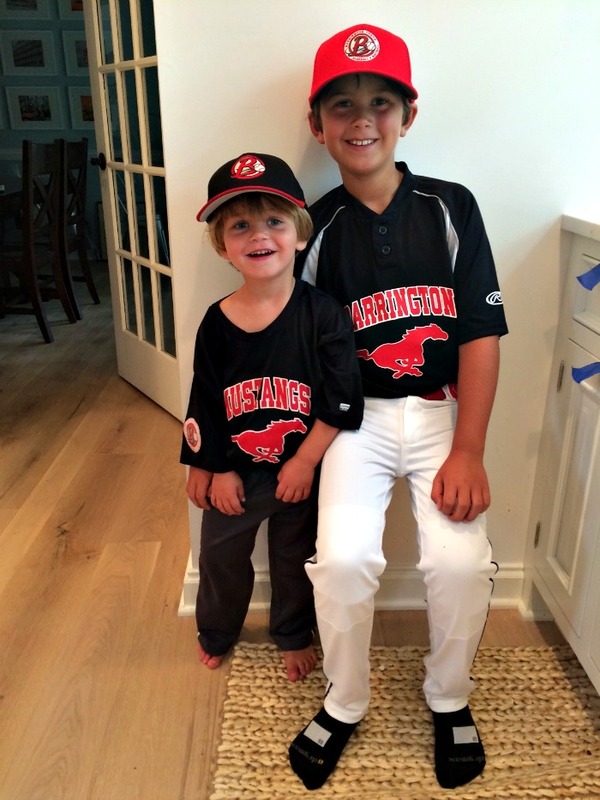 So, yippee – baseball season is finally here! I thought it would be great to do a mini series on sportsmanship throughout the um, long season. It is something that I’ve been spending time thinking about and to start, let’s highlight the parents of the little athletes shall we? Rock stars for sure, I feel you toting kids here and there to various fields with equipment practically falling out of your trunk, cheering your little(s) on in rain or shine, 30 degrees or 100. I’m so there with you. Yet, occasionally we run into a more, well, aggressive personality. We’ve all seen them: overwrought, hyper-competitive parents yelling at their kids, kids’ coaches, or even teammates during youth sports. Thankfully I don’t run into this all that much in our town but we dabbled with it in other’s during football season and it was, well, a bit cringe worthy. And it’s truly hard not to get wrapped up in emotionally when you see it affecting your own child. I totally get it. I wonder if it might be too much of a good thing. If you think about it, we have access to a ton of information about everything under the sun courtesy of the Internet. Back when we were kids our parents didn’t have access to the information overload that we do. If dad spends some time Googling football tactics, he might start to think that he could substitute coach. (And he could, but do B & L really want him to? )If I dig a bit deeper, I truly think the root cause of this obsession to control at sporting events really boils down to anxiety. It’s easy to get caught up in feelings of anxiety or stress over our kids’ happiness, safety, and ability to navigate the sometimes choppy waters of life. This is a natural, but mostly unfounded, fear. And in some parents, these concerns manifest into an overpowering feeling of panic that activates the “crazy copter” within. So, how can we as parents avoid these pitfalls and redirect our energy to ensure that we are instilling confidence in the boys, their coaches and teammates? First, it is important to leave the coaching to the coach. Sounds obvious, right? But it can be easy to forget in the heat of the moment. While one may disagree with coaches at times, there is a reason they are in charge and they know what they’re doing. We need to trust them! They are devoting countless hours of volunteering while also raising a family and oh, yes, of course….holding down a job. I know that if I let the coaches do their job, not only does it benefit the boys, it also allows me to focus on enjoying the game, which is why I am there. I am, most definitely, not in charge. That would be frightening for all. Keeping the aforementioned tip in mind, it is important to not call out a coach about a decision made or a play called. Ever. I try to remember that part of the coach’s job entails keeping the best interests of the team in mind, not my one child. Believe me, I get it: It’s perfectly natural, as a parent, to feel opposed to a decision that doesn’t appear to immediately benefit your kid. However, for the sake of the whole team, there is a bigger plan the coach sees that we may not. You know how both teams line up at the end and tell each other, “good game” while high fiving each other? This is the attitude we all need to adopt when attending a game. Leading by example is always the most powerful method for teaching children good sportsmanship. If they can put on a smile and enjoy the game, we can, too! Another very important point is this: my boys athletic performance doesn’t define who I am. Bless it, I can barely hit a ball. These two could not have been born to a mother that is easier to impress in terms of the athletic world. I am honestly whole heartedly amazed at what they can do daily. So not only does their performance not define me, I want them to know that it doesn’t define who they are, either. I want to reinforce the overall value they bring to the team; doing so instills confidence, strengthens the commitment to their team members and motivates them to work harder for the overall good. What a great way to teach them team work, right? Speaking of performance, I want to cheer them on through mistakes as well as victories. And reassure them that no one is perfect, and that this is ok! I also teach them that mistakes offer ample opportunities to learn. I try and share this with L & B all the time. And I demonstrate through my own behavior that I mean it. Even if B misses that baseball sitting perfectly on the batting tee, I’m putting it right back up there for him to try again. I know that self-esteem can be gained from playing a sport. This is one reason, in addition to the Herculean levels of energy I’ve discovered my boys possess and need to run off, why I got L and B involved in sports at a young age. When kids have respect for themselves as people as well as respect for their athletic abilities, they’ll be that much better equipped to play with confidence. Also, self-respect inevitably leads to respect of others, which will translate to their coach and teammates – and lead to a more cohesive, stronger team dynamic. A win-win situation all around. Spicy sausage and white bean soup. Let’s be honest. We’ve had a pretty good run here. Winter was mild and we’ve had a nice tease of spring here and there. So when in years past at this time I may have been complaining over and over and over about the weather this year just can’t be that. Chicago? You did well. Finally. And yet when those (sometimes) dreary spring days do hit they can start to feel a bit….mundane. 40 degrees, no sunshine, rain showers. We all know it needs to happen in order for spring to come but my goodness those days can feel long. Combine it with a week of sick kids and your turning to the kitchen for some much needed comfort. Yet comfort food is so last season am I right? We are in spring! No more rich sauces and heavy carb loaded dishes, please. With the tease of warmer weather to come we’ve already got the grill going and I just can’t, can’t, go back. 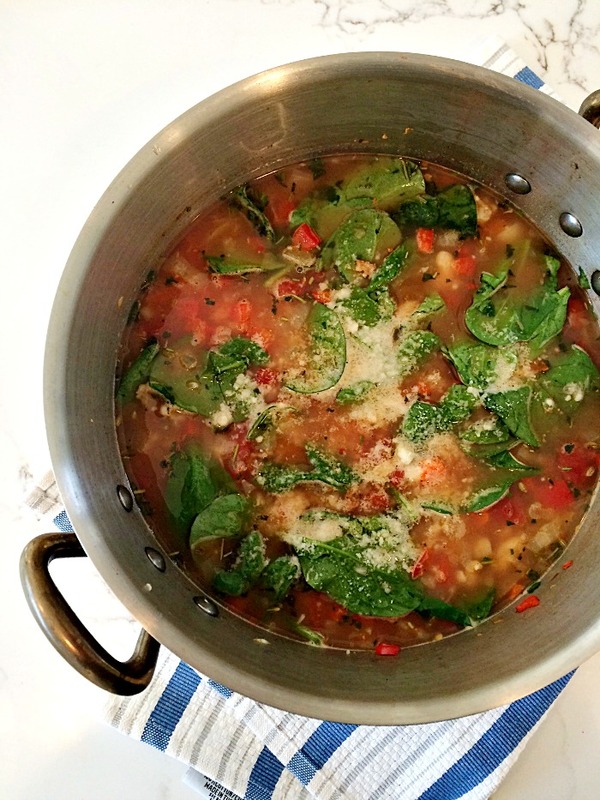 So lighter soups to the rescue! Chock full of health they provide the warmth and comfort we still may crave and yet stay easy on the waistline because, well, summer is to follow. This is the perfect soup for March, April, and yes even sometimes May. Get this white bean and sausage soup going this week and be comforted in knowing that every single day is one step closer to summer. SUMMER!!! I. can’t. wait. Heat oil in a large stockpot over medium. Cook sausage, stirring occasionally, until browned, about 10 minutes. Transfer sausage to a plate. Add onion, peppers, carrots, and garlic to pot and cook, stirring frequently, until onions are tender, about 6-8 minutes. Add sage, rosemary, bay leaf, salt, black pepper, and red pepper flakes. Stir in chicken stock, tomatoes and their juices, and reserved sausage. Bring to a boil, then reduce heat and simmer until flavors have blended about 15 minutes. Using a fork, coarsely mash beans from 1 can and add to sausage mixture. Stir in remaining can of beans; let simmer 10 minutes. Divide spinach (whatever greens you pick) among bowls, then ladle soup over spinach. Top soup with Parmesan. C’s Picks – week of March 27th. After a week off from C’s picks, it’s nice to be back in the saddle. And by saddle I mean kitchen. A brand new line up for you all is ready to go for the week and it sure is tasty. Let’s do this! Today, of course, is all about Easter. We are dining on brunch in the morning with my family and off to my mother in laws post nap for dinner. I’m in charge of dessert and thinking these so need to happen. Monday let’s get back in the routine of cooking something oh so satisfying and healthy. 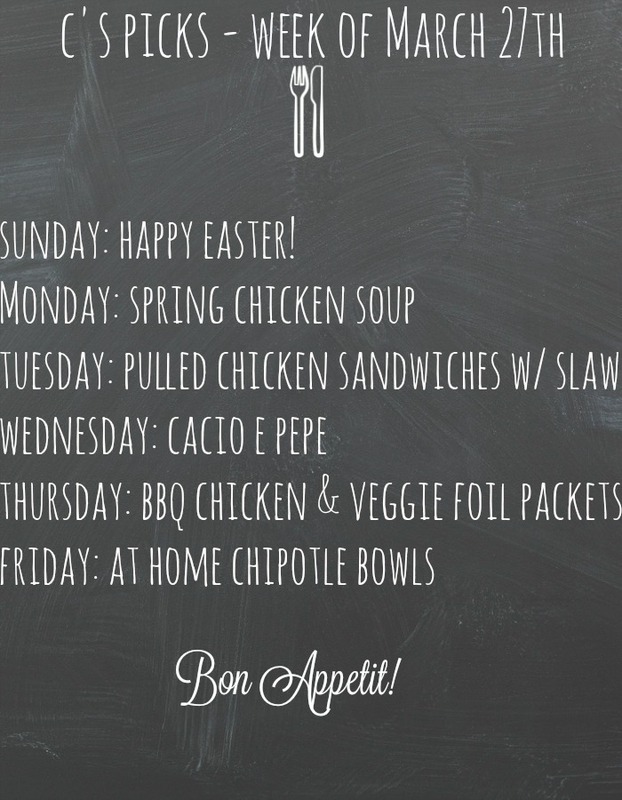 We can’t get enough of this spring chicken soup. Perfect for those 50 degree days. A brand new pulled chicken sandwich with fresh slaw looks perfect for a busy Tuesday night. All served up on toasted ciabatta? Yum. Love love love this recipe. Perfect for a date night in, or, you know wrestling around with the kids. Or both. Eek! I can’t wait to try out these bbq chicken and veggie foil packets. 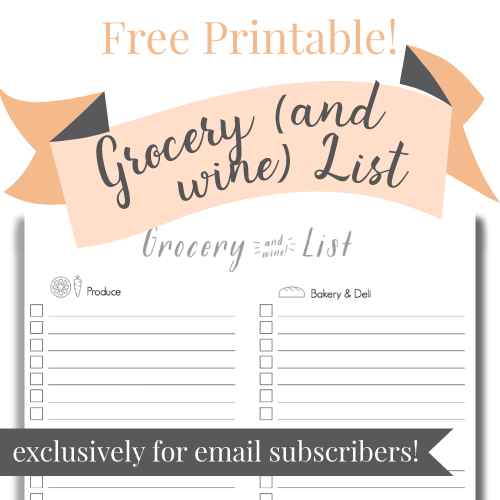 How easy and healthy! As always, I will keep you posted on the results. I hope it’s as delicious and easy as it looks. And that brings us to Friday. Love chipotle? So. do. we. This recipe is right up our alley. Serve it with all the fixings: brown herbed rice. Guac. Salsa. Cheese. Sour cream. Tortilla chips. Cilantro. You get the picture. This is a wonderful dish to entertain with should you be doing any of that this week. Have a great week everyone, happy cooking! Honestly, I’ve been putting off writing about this recipe because there are simply no words. No words at all to even remotely begin to explain how good this dish is. How absolutely perfect for entertaining it is. How easy it all comes together. How it sits so lovely on one large platter. How I’ve literally made it five, yes five, times in about four weeks. Do I need to go on? I so hope you are convinced. Because it’s absolutely killer. This over roasted chicken shawarma can be served a million ways but our favorite is with chopped up olives, cucumbers, tomatoes, feta, parsley. Trader Joes garlic pita bread and (semi) homemade hummus on the side. Oh my yes. So dig right in and please – don’t count on any leftovers. 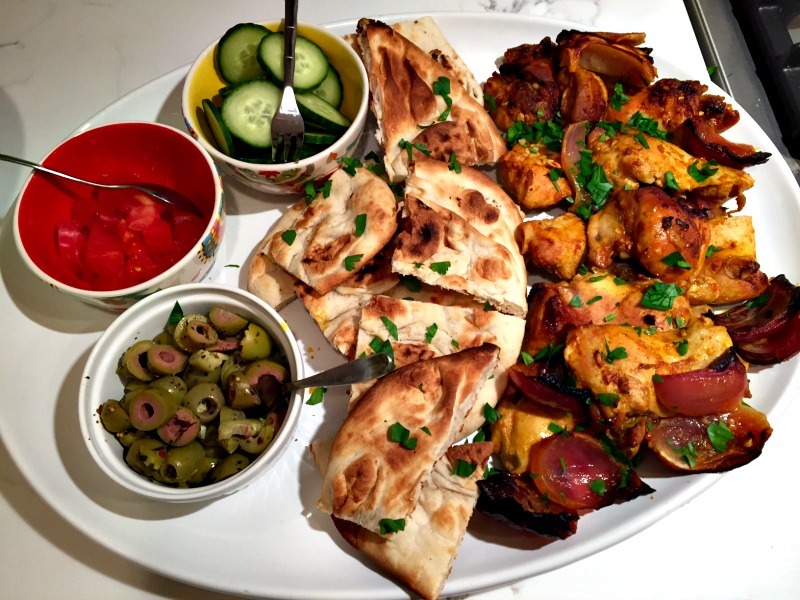 A delicious roasted chicken recipe perfect for entertaining! Combine the lemon juice, 1/2 cup olive oil, garlic, salt, pepper, cumin, paprika, turmeric, cinnamon and red pepper flakes in a large bowl, then whisk to combine. Add the chicken and toss well to coat. Cover and store in refrigerator for at least 1 hour and up to 12 hours. When ready to cook, heat oven to 425 degrees. Use the remaining tablespoon of olive oil to grease a rimmed sheet pan. Add the quartered onion to the chicken and marinade, and toss once to combine. Remove the chicken and onion from the marinade, and place on the pan, spreading everything evenly across it. Put the chicken in the oven and roast until it is browned, crisp at the edges and cooked through, about 30 to 40 minutes. Remove from the oven, allow to rest 2 minutes, then slice into bite sized pieces. Scatter the parsley over the top and serve with your choice of toppings. I’m sure we’ve all seen something like this on Pinterest, but one of the easiest foods to make into fun shapes is a dinner roll. I know they look a little intimidating in terms of making the intricate details but trust me when I say that this one is pretty easy! There are a lot of recipes out there that advise cutting slits in the tops of the rolls for the bunny ears, but that usually ends up looking less than ideal. I found a recipe that was adapted from a porcupine roll concept, but ends up actually working pretty well for cute little bunnies too! In a big bowl, add the flour, yeast, brown sugar, cinnamon, and salt. Meanwhile, in a saucepan, heat the water, butter and corn syrup until it’s quite warm and add it to the bowl with the flour mixture. With an electric mixer, beat the mixture for 2 minutes on medium speed. Stir in enough flour to make a light, soft dough. On a surface lightly sprinkled with flour, knead the dough for around 8 minutes, or until smooth and stretchy. Let it rest for about 10 minutes while covered in a paper towel. Cut the resulting dough into roughly 16 parts. With 12 of them, make small ovals and set them aside. 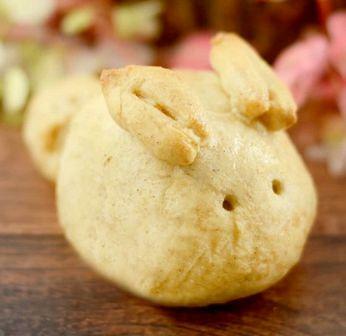 With the rest of the dough, make 12 small balls for the little bunny tails, and 24 long bunny shaped ears. With the skewers, shape the ear and cut around the edges with kitchen shears. Stick the resulting ears onto the roll with a bit of egg whites, and repeat this process for the tails. Finally, poke holes just under the ears to make the eyeholes. Take a deep breath; it’s all downhill from here! Preheat the oven to about 350 degrees. Once ready, place the bunny-shaped dough rolls onto a greased baking sheet, and bake for around 15-20 minutes, or until golden brown! Remove from the pan and cool them on a wire rack. Voila! Bunny rolls! 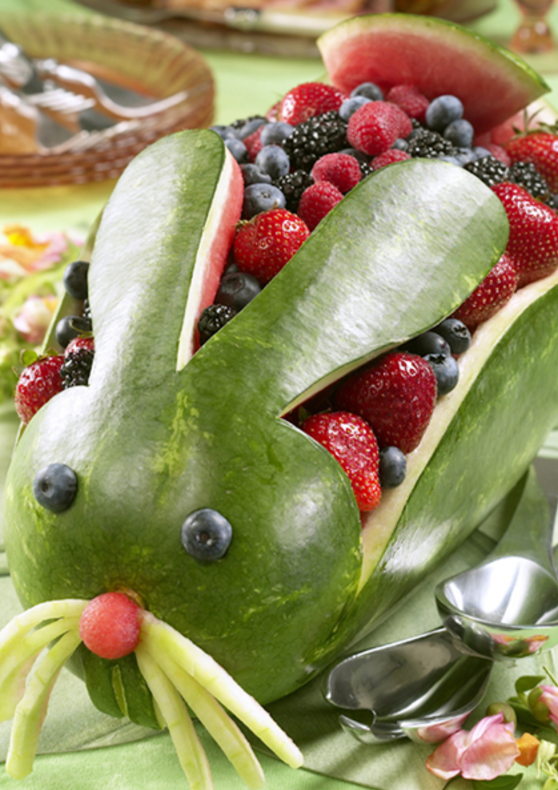 There isn’t a more refreshing way to provide your table with some Easter pizzazz than cutting out a bunny shaped fruit bowl! This one will definitely test your inner artist, but the ooh’s and ahh’s will be well worth your time! You don’t need much here, but this all comes down to finesse and skill with the knife. Start by cutting a ¼ inch slice off of the bottom of the watermelon so that it can easily be set on a plate to put on the table. Using the pencil or marker, draw where the ears and upper body of the bunny will be. Much like carving a pumpkin, cut along your lines, and be sure to remove any excess rind. Set any extra rind aside for the whiskers and a tail! Using a large spoon, hollow out the watermelon, being especially careful around the ears! With the excess rind, cut some small spears that will be used as whiskers, but trim off the outer rind to make it a lighter green and provide contrast. Using a melon baller, use it to cut out small eyeholes and a hole for the nose, and plug the holes with the remaining melon balls or blueberries for the eyes. Use toothpicks to be sure they don’t fall out! What’s a bunny without the characteristic buckteeth! Cut out a rectangular shape below the nose, and trim a small line down the middle of the rectangle to make it look like two separate teeth. Using the toothpicks, attach the whisker pieces that have been set aside just below the nose. Fill it on up with the berries, and there you have it! The most delicious, and darling, Easter centerpiece ever! 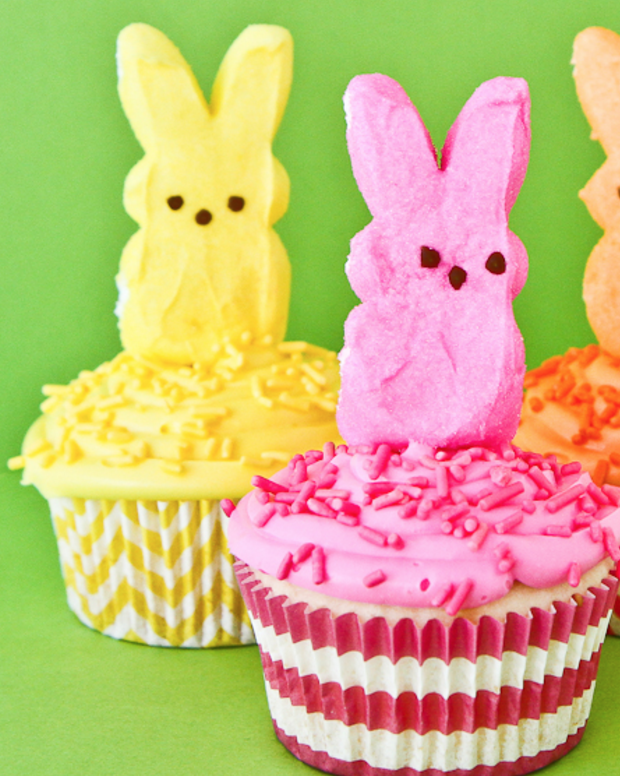 For the finishing touch, there’s nothing that screams “EASTER” quite like a Peep. I’m sure we’ve all felt the chills of biting into these sugary, gooey marshmallow treats, so what a better way to have an Easter dessert than to put them on cupcakes! 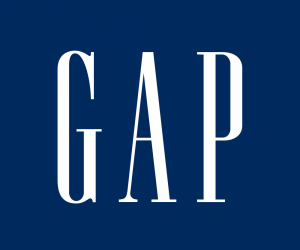 I know the previous two ideas have involved quite a bit of work, but rest easy. These are a breeze! Depending on your family’s cake preference, make the mix in a muffin pan, and garnish with a spring colored frosting. Add some sprinkles on top, and finish with a Peep on top (a chick, or a bunny, it doesn’t matter since both are Easter themed!) Be sure to warn the eaters that the Peeps are attached with a toothpick so there are no accidental injuries while eating these delicious treats! I so hope you found something that can make your Easter holiday just a bit more fun and festive!